MANILA, Philippines - Team Sarah artists clashed in "The Voice Philippines" The Battles Round on Sunday, December 7, 2014. It was a battle of vocals between Youtube sensation Kokoi Baldo and Elmerjun Hilario as they performed Mr. Big hit "To Be with You." The 35-year-old Reggae singer from Bacolod Kokoi Baldo has captured the heart of Filipinos in the Blind Auditions as he sang Matisyahu hit "One Day." The video which was uploaded on Youtube is now considered as the most viewed videos uploaded by The Voice of the Philippines account as it already garnered a total of 3.7 million views as of press time. 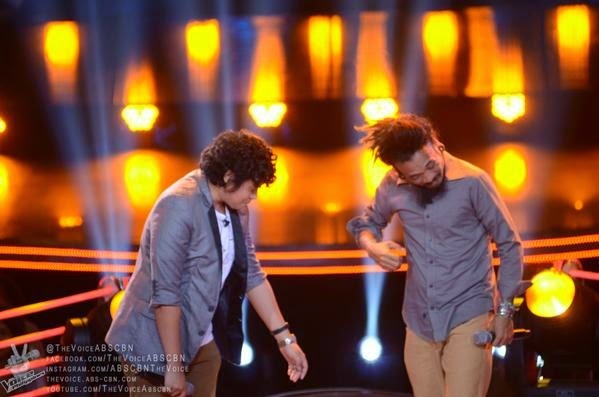 Coach Lea and Apl were impressed on the vocal skills of Kokoi while Coach Bamboo chose Elmerjun. Coach Sarah declared Kokoi as the winner in the battles round. He will advance to the next round of the competition – the Knockout rounds. However, the three coaches have tried to steal Elmerjun. The latter got a second chance to stay in the competition as he chose Team Bamboo. In the second season of the show, the eliminated artists may get a second chance if another coach decides to steal them. If two or more coaches want to steal a losing artist, it’s up to the artist to choose the team he or she wants to join. A coach may only steal two artists throughout the battle rounds. Coach Sarah had selected the groups of artists who will compete and the songs they will perform in the Battles. At the end of the Battles, each coach will have nine artists who will advance to the Knockout rounds, two of which are stolen artists from the other teams. The second episode of The Battles on Sunday dominates online conversations with '#BattlesPH' and 'Lady Marmalade' among the trending topics.